The Senate on Monday filed a suit before the Supreme Court praying for among others, an order reinstating Justice Walter Onnoghen as the Chief Justice of Nigeria, Punch report. The Senate action came after it canceled its scheduled plenary earlier billed for Tuesday (today). The Clerk of the Senate, Mr. Nelson Ayewoh, who announced the cancellation in a statement signed by him, did not give reasons for the action. But the Special Adviser (Media) to the Senate President, Mr. Yusuph Olaniyonu, in a statement explained that the cancellation was due to the last-minute decision by the Senate leadership to seek a judicial interpretation to Onnoghen’s suspension by President Muhammadu Buhari on Friday. 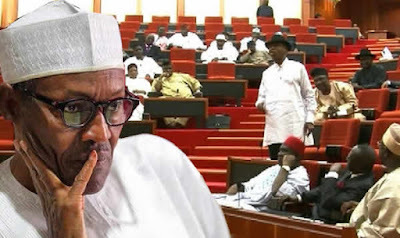 In the suit marked SC.76/2019, the Senate asked the apex court to declare the suspension of Onnoghen without the support of two-thirds majority of the Senate as a violation of section 292(1)(a)(i) of the constitution. The suit also asked the apex court to issue an order restraining the two defendants in the suit – President Buhari and the Attorney-General of the Federation, Mr. Abubakar Malami – from continuing or repeating the violation of the constitution and disregarding the power of the Senate in respect to the suspension of the CJN.